My name is Lisa. I am 30 years old and come from Darmstadt. I love music and traveling around the world to get to know different cultures. Before studying I worked as a hairdresser. I love the creativity of this job. Because of that I decided to become a teacher for the haidressers. My name is Kathrin, I am 29 years old and I come from Frankfurt. Before I decided to attend the trainee teacher program, I studied “Social Work“. I worked in a bilingual kindergarten and an after school club for primary school pupils. During my studies, I spent an “Erasmus“ term abroad in Stockholm and worked for a social project in Buenos Aires, which definitely encouraged me to apply for the“Erasmus Plus Program“ in Jyväskylä. I am Michaela, a 25 year old trainee teacher from Germany, living in a small town next to Frankfurt. Since September 2016 I teach the kindergarten teachers pedagogy and politics. Before that I studied social pedagogy and worked as a social worker in the kindergarten and later on in youth welfare services. I like traveling and getting to know new people and cultures. My name is Janine, I am 38 years old and come from Kassel. I studied Business Administration and English. In my freetime I like spending time with my family and doing some sports like Yoga. I am interested in meeting people from different cultures and countries. We are trainee teachers at vocational schools in Germany. Our subjects are “Hairdressing“ and “Politics“ (Lisa), “Business Administration“ and “English“ (Janine), “Early Childhood Education“ and “Politics“ (Michaela and Kathrin). 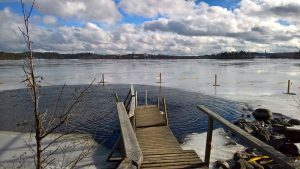 We stayed three weeks in Jyväskylä and prolonged our stay with a cruise from Helsinki to St. Petersburg, Tallinn and Stockholm. 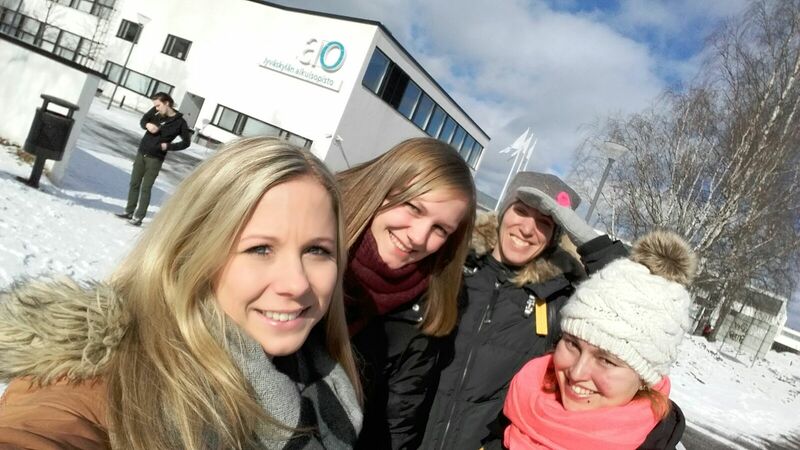 During our stay we got to know the different campuses of “Jyväskylä AO“. We got a great overview of different programs related to our vocational subjects. We also presented the German school system to the students and teachers to compare similarities and highlight differences. Trying to be typical Finnish, we went ice swimming! It was incredible and highly encourage it. The Finnish sauna afterwards was amazing! We also attended an ice hockey game, which we recommend. We also explored around the town, visited the Toivola Old Courtyard, went up the tower of Jyvläskylä and visited the church. Do you think the time has been too short/long? The length of time was exactly right. The program is mixed and well-organized which made the time fly by. It gave us a great overview about the Finnish school system from pre-school programs to vocational trainings and also the adult education training. Also the Introductions about the background of these programs where very helpful to understand the Finnish way of education. After school, especially in the evenings and on the weekends, we had plenty of time to explore Jyväskylä, with helpful recommendations of the teachers. In any case, all the Finish people we have met, left a great impact. They were all extremely friendly and helpful! Concerning the vocational school, we realized that the school system is different to the German one. The main difference might be, that in Jyväskylä, they do a lot of practical work in school, whereas in Germany, most of the practical work is done at the workplaces. The hairdressers for example have their own client service at school or the practical nurses organized gym lessons for elderly people at school. The practical nurse program is different to the kindergarten teacher program (Erzieherausbildung) in Germany. Finnish students get a great overview during their studies about working in child care, but also rehabilitation or dental care and working as a nurse for example. To become a kindergarten teacher, they have to continue studying at an university. A big difference is also that Finnish students get free lunch at school! Students at Jyväskylä College have a great chance to go abroad during their vocational programs, which the school encourages. We felt very welcome during the whole stay at Jyväskylä. Finnish people were cordial all the time. The teachers, the hosts, people in the streets and in the shops. 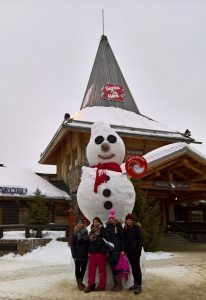 They all were very helpful and made our trip great. We saw nice places all around Jyväskylä as well, like old factories, shops and countryside. At the hairdressing and beauty department we all were invited to enjoy a full-body-massage. It was an amazing experience to see (and feel) how independent the students of the first year were working. We got to know a great overview of different situations of the schools daily routine. For example visiting elderly people and a kindergarten in the social and healthcare department or different workplaces in the business sector. Also our weekends were very exciting. We stayed 2 days on a lake near Laukaa. We relaxed in nature directly at the lake while sitting in a hot tub and using a real Finnish sauna. We also went to Lappland for 2 days to see Santa in the Christmas Village and some northern lights. Very impressing! Give three tops and tips (based on your own experience) to someone who is planning to come to Jyväskylä. 1. 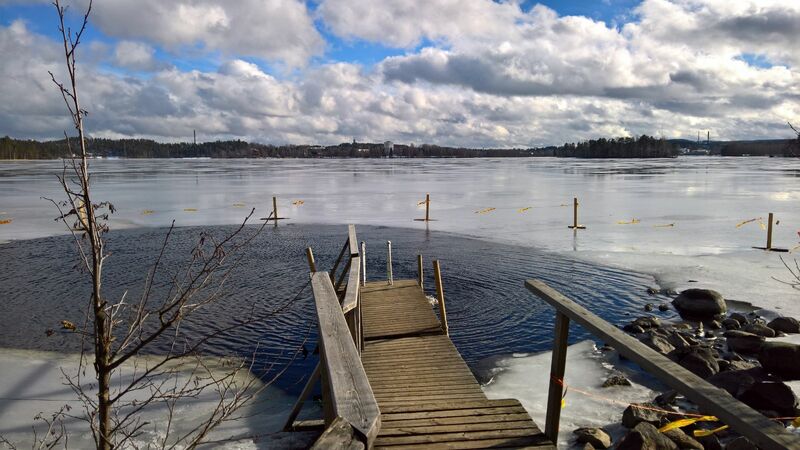 Jump into frigid waters and ice swim followed by a traditional Finnish sauna! 2. Go to an ice hockey game! 3. Renting a cottage at the lake, equipped with a hot tub and sauna. 4. Dive into the Culture! Meet Finnish people, eat typical Finnish food and try local drinks.